I just want to thank you for all your posts! 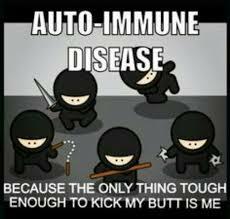 I was diagnosed in 2014-after undergoing many doc visits over seven years-Age 46-could not stand, knee inflammation, back problems unspecified after 5 MRI’s-then fibromyalgia and neuropathy in left leg with sciatica-Cortisone and nerve root blocks etc….. jeez. Finally I told a foot doctor about my father’s Psoriasis and my brother’s psoriatic arthritis and Aunt’s thyroid and I.Cystitis and-insisted on auto-immune panel-Well here were the findings as I struggle to type-Hand and finger pain. Elevated Sed rate-RF factor-79, Ana positive-SSA-anti Ro-I even diagnosed myself before seeing Rheumy. I knew it-but did not have a clue about Sjogren’s. I remember dreaming I felt like cotton balls were inside my mouth and horrible joint and flu-like pain. My Mom was going through lung cancer and I did not want her to know how bad I felt 4 years prior-God bless her, she just thought I was lazy and liked to sleep late-zzzzzzz my whole life and suffered severe anxiety.. Well she passed away and did not ever know in 2013 and I took good care of her-lost my father-I believe due to extensive doses of Methotrexate over 7 years to a rare cancer attached to his heart in 1995.This is a very tough journey and even my brother and sister do not want to talk about it, or acknowledge i and ignore me. Who the heck would want or make this up? I feel so isolated. I have been with a great guy for 24 years-but I know it is taxing. We do not have any children-but my fatigue and pain is getting worse. Dry eyes and mouth too. 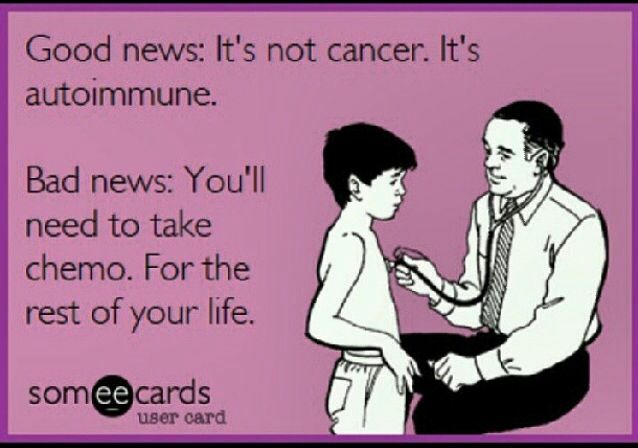 This disease is horrible-I hate going to doc appts and I am taking more of a functional medicine approach-but cannot afford to see one. No dairy, soy ,or gluten and shed 11 pounds.. Still worn out. Insomnia right now- tired wired. I just want you to know how much I love your blog-It makes me laugh and cry. God bless you! If you get a chance check out Tom O’Bryan and the auto-immune betrayal series. 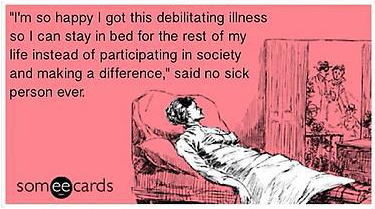 I will not touch Restasis, D-Mards, Biologics, or chemo etc… I am primary right now-but I cannot afford to be sick. All this over the counter stuff and toxin free everything-well you know! Let us be grateful for everyday we get out of bed and shower Lol-Take care and heal Mrs.Wanton-With much admiration-where is our lottery check-since we are the 1%. Ha Ha! Gotta have a since of humor. I think I wore myself out-Finally- I will drag my sleepy sloth self to bed. Sweet dreams! Thank you for sharing some of your medical journey with me, and my blog readers. You have been to hell and back, and I’m so sorry to hear of your difficulties.Your honesty about your struggles has me in tears too. But beside your hurt, I feel your heart-warming authenticity and your sense of humor shines through too. I hope better days are ahead for you! And thank you so much for reading my blog, I’m happy you find it helpful and entertaining.To me the ONLY blessing of having this disease is connecting with some of the most wonderful, compassionate, supportive people on earth – people like you who despite the pain and struggle reach out to others, tell their stories, and keep a sense of humor through all the Sjogren’s and related “messiness”. I will check out the Tom O’Bryan info you suggested. I appreciate you taking the time to respond at length, as I do understand the energy just typing a reply can take and the hurt of the sore fingers, and hands too. Take care & be as well as you can. Thank you so much- Keep blogging-It really helps, Thank goodness I love soup.God bless and take care. I do not want to say keep fighting- Because our bodies are always fighting-Ha! Ha!. Like my Mom said never,ever give up! Best of luck to you and your family on this journey. Apparently so. Thanks for reading. Yes!!!!! I can totally relate…….to……Life Divided in Two !!! I wrote about your story, your disease, on April 26. (http://wp.me/p1pIBL-2eC). I wanted the world to know about this shadowed disease. I feel with you, and hope that by sharing your story the world knows a little more about Sjogren’s Syndrome. Thank you so much for all that you have shared. It has definitely given me even more understanding of the trials and tribulations you have endured. And the writing has been phenomenal! Thank you for reading, and understanding.And for the wonderful compliment on my writing, I am honored you think so highly of my writing.